Moeness Amin, PhD, Director of Villanova University’s Center for Advanced Communications (CAC) and a professor in the University’s Department of Electrical and Computer Engineering, has been awarded the 2017 Fulbright Distinguished Chair in Advanced (Defense) Science and Technology. Fulbright Distinguished Chair Awards are among the most prestigious appointments in the Fulbright Scholar Program. Candidates are eminent scholars with significant publication and teaching records. The Fulbright Distinguished Chair Awards comprise approximately 40 distinguished lecturing, research and lecturing/research awards that range from three to 12 month tenures. Dr. Amin’s Fulbright Distinguished Chair appointment is to the Defense Science and Technology Group (DSTG), Australia. The Fulbright Distinguished Chair in Advanced (Defense) Science and Technology was launched in 2011 to bring a distinguished U.S. researcher to Australia to share knowledge and build relationships with Australian researchers working on key issues facing both countries. Dr. Amin is the fifth holder of that Chair. His research will focus on enabling communications systems to capitalize on the resources of radar infrastructure while striving to be transparent to radar operations and mission. His application to the Fulbright Program was supported by the host, DSTG, and endorsed by four Australian universities: University of Wollongong, University of Adelaide, University of New South Wales, and University of Western Australia. Dr. Amin plans to spend five months in Adelaide, Australia during spring 2018. As Chair, he will work in a priority area for the Defense Science and Technology Group, and engage with faculty and students through guest lectures and seminars. During his tenure at DSTG Dr. Amin will also explore long-term collaborations and institutional linkages. A national speaking tour in Australia is an integral part of the distinguished chair program, and will be arranged to gain more information about the research and the program. Dr. Amin has traveled extensively throughout Australia and has served, over the last decade, as Partner Investigator on two Australia Research Council (ARC) grants, exceeding $1,000,000, both on radar sensing and imaging. These grants helped launch through the wall radar imaging research in Australia. Based on the work performed under these ARC grants, Dr. Amin’s Australian collaborator won the 2011 prestigious Eureka Prize for Outstanding Science in Support of Australian Defense or National Security. 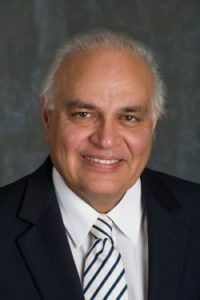 Dr. Amin has published more than 40 papers with his colleagues from the University of Wollongong, the University of New South Wales, and the DST Group. Dr. Amin’s past distinguished awards include being a Fellow of the Institute of Electrical and Electronics Engineers (IEEE); Fellow of the International Society of Optical Engineering; Fellow of the Institute of Engineering and Technology; and Fellow of the European Association for Signal Processing. He is the recipient of: the German 2016 Alexander von Humboldt Research Award; the British 2016 IET Achievement Medal; the 2014 IEEE Signal Processing Society Technical Achievement Award; the 2009 European Association for Signal Processing Individual Technical Achievement Award; the 2015 IEEE Aerospace and Electronic Systems Society Warren D White Award for “Excellence in Radar Engineering”; the 2010 NATO Scientific Achievement Award; and the 2010 Chief of Naval Research Challenge Award. Dr. Amin is the Recipient of the IEEE Third Millennium Medal. He was a Distinguished Lecturer of the IEEE Signal Processing Society, 2003-2004. Dr. Amin has over 700 journal and conference publications in signal processing theory and applications, spanning the areas of wireless communications, radar, sonar, satellite navigations, Ultrasound, healthcare, and RFID. He has co-authored 22 book chapters and is the editor of three books: Through the Wall Radar Imaging, Compressive Sensing for Urban Radar, and Radar for Indoor Monitoring, published by CRC Press in 2011, 2014, 2017, respectively. Since 1842, Villanova University’s Augustinian Catholic intellectual tradition has been the cornerstone of an academic community in which students learn to think critically, act compassionately and succeed while serving others. There are more than 10,000 undergraduate, graduate and law students in the University’s six colleges – the College of Liberal Arts and Sciences, the Villanova School of Business, the College of Engineering, the College of Nursing, the College of Professional Studies and the Villanova University Charles Widger School of Law. As students grow intellectually, Villanova prepares them to become ethical leaders who create positive change everywhere life takes them. For more, visit www.villanova.edu.